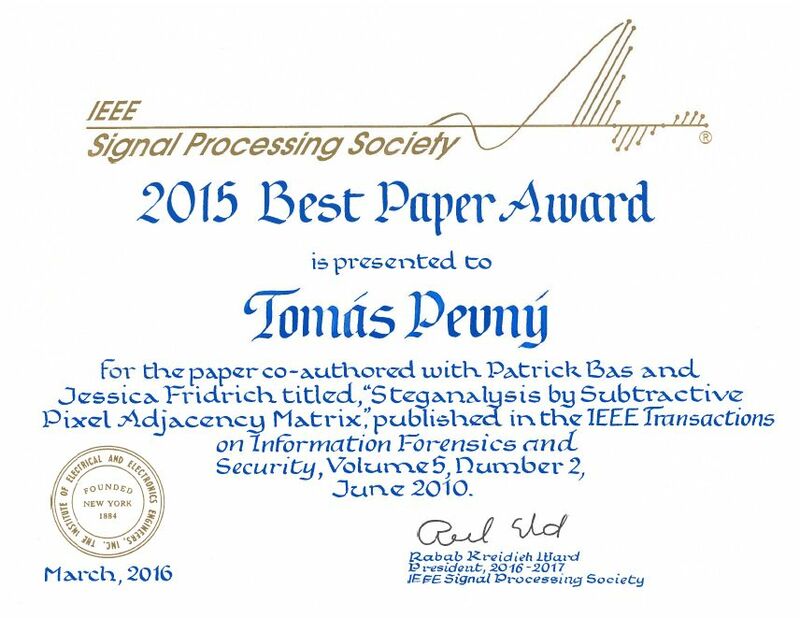 Tomáš Pevný was awarded by IEEE Signal Processing Society for his sustainable impact research. He received the 2015 Best Paper Award for the paper "Stegananalysis by Subtractive Pixel Adjacency Matrix". Branislav Bošanský, young researcher and assistant professor at the Department of Computer Science, CTU in Prague gained the Cisco Outstanding Thesis Award for 2015 for his doctoral thesis "Iterative Algorithms for Solving Finite Sequential Zero-Sum Games". Pavol Žilecký won the best IT diploma thesis award of they year 2015! The Czech Alpha Chapter of UPE has received an Outstanding Chapter Award for its activities. Young researcher Michal Čáp from our Department has received a special prize of Jury of Joseph Fourier 2015 for postgraduate students for research in computer sciences and informatics, organized by French embassy.